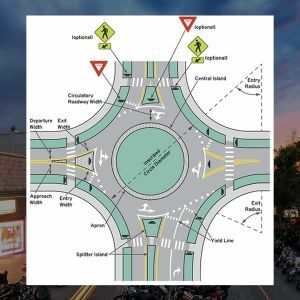 The City of Sturgis, South Dakota announced a plan to install European-style traffic roundabouts at both ends of Historic Main Street in the heart of Sturgis to increase traffic flow as next step in downtown Rally-friendly infrastructure improvements. Local civic officials unveil plan to replace two key downtown intersections with modern European-style traffic roundabouts that require no signal or stoplight as part of ongoing effort to improve the popular tourist town’s infrastructure and ease the annual burden of Rally traffic on local thoroughfares. Sturgis, SD, April 1, 2018: As part of the continuing effort to improve the city’s infrastructure and provide an enhanced Rally experience for Sturgis Motorcycle Rally visitors in coming years, the City of Sturgis announced plans to replace two iconic intersections on Legendary Main Street in downtown Sturgis with European-style traffic roundabouts. A modern roundabout is a circular intersection where drivers travel counterclockwise around a center island. There are no traffic signals or stop signs in a modern roundabout. On entry, drivers yield to traffic in the roundabout, then enter the intersection, circle, and exit at their desired street. “With all of the improvements on Main Street, I think the city saw this as the next logical step in downtown improvements,” claimed Rally Director Jerry Cole.